CORINPHILA Veilingen bv – Fine stamp auctions since 1974. JOHN BULL STAMP AUCTIONS – Hong Kong‘s oldest philatelic auction house, founded in 1975. 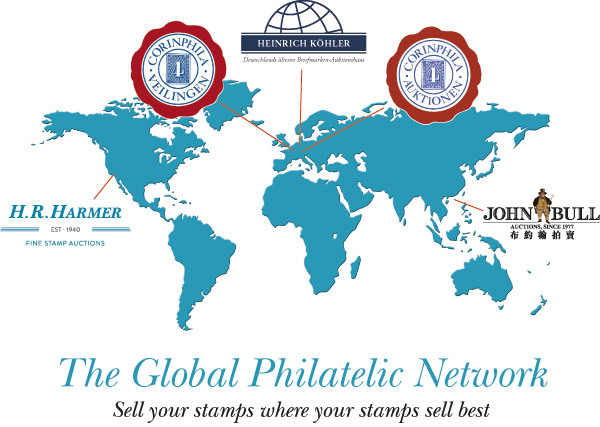 The Global Philatelic Network features decades of experience in the most relevant philatelic markets internationally, with expertise in stamps at international and national levels. The network partners are comprised of over 25 philatelic specialists from different countries, some are world renowned experts on national panels or members of the international experts group ‚Association Internationale des Experts de Philatelie‘ (A.I.E.P.) They have access to the most important philatelic libraries, compiled over decades, where relevant publications and technical books can be found. All experts of The Global Philatelic Network have an extensive amount of experience in their profession and speak all the necessary languages. To maximize results for your stamps: If it makes sense and is your will to auction your stamps on different continents in their ‚home countries‘ The Global Philatelic Network will take care of all the necessary arrangements. If you wish to consign to Heinrich Koehler, you can bring your consignments to any of our sister companies and the collection will be treated as if you brought it directly to our office in Wiesbaden. This takes place without any nerve-wracking border crossings and customs formalities. You can conduct the negotiations in your language and will get the same conditions. Our sister companies then send your stamps to us without any cost to you, the processing takes place just as you would expect from Heinrich Koehler. Call our CEO Dieter Michelson or our experts Michael Hilbertz or Tobias Huylmans, we will gladly answer all your questions.